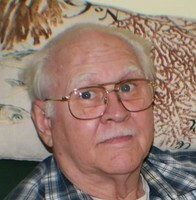 Mr. Daniel Marvin Leckie, age 76, of Jonesboro, passed away on October 7, 2017. His passing has left an emptiness in all that have gotten the honor to have known him. He was so intelligent that you were “wowed” by all of the facts and figures that he knew and you were amazed on his creative ideas as to fixing problems. His writings would warm your hear and most of all – make you laugh. He loved to make people laugh; it was one of his favorite things he did. He had a kind and generous heart. He would give you the shirt off of his back and more if he could. The stories from his adventurous life never got old to hear about. He was a great husband and father that loved us and taught us as much as he could. He is survived by his loving wife, Marion Leckie; son and daughter-in-law, Daniel Martin Leckie and JoJo Leckie; son, Daryl Alan Leckie; grandchildren, Raleigh Browder, Susie Browder and Bella Leckie; and brother, Ricky Leckie. Memorial Services honoring Daniel’s life will be held on Saturday, October 14, 2017, at 4:00 PM with Yancey Green and Sam Camp officiating at Tara Garden Chapel – 681 North Avenue – Jonesboro, GA 30236. (770) 471-7171.